Renewal by Andersen® has always been aware of the environmental challenges that we face today. We provide solutions to creating better homes and environments with our products and practices. Through this, our parent company, the Andersen Corporation, became the first window manufacturer to receive the Green Seal Certification for Environmental Stewardship. Our St. Charles, Missouri, energy efficient windows come with eco-friendly materials. Our Fibrex® frames have 40% reclaimed wood fiber by weight, which is the highest SCS-certified recycled content of any window company. With Fibrex, you don’t have to worry about cracks, rot, scraping, or painting. This way, you can save money on maintenance costs and repairs. We also use High-Performance™ Low-E4® glass for our casement windows in St. Charles, MO, or other window styles. This has a minimum of 12% reclaimed glass by weight. It also has a special coating that reduces water spots and keeps a consistent indoor temperature. We help create a cleaner environment because our products don’t contribute much to l andfill waste. Our windows and patio doors are manufactured to st and strong against any weather condition. If you replace your old windows with one of our options, you won’t have to think about replacement for a long time. Our products meet the strictest indoor air emission st andards in the country. We are also the only window company to receive the Scientific Certification Systems Indoor Advantage Gold™ certification. This means that you and your family can breathe fresh air because our products don’t emit harmful toxins through off-gasing. Our sustainable products also help homeowners reduce energy consumption. We follow a systematic process for every windows installation in St. Charles, MO, to ensure proper installation. This results in an air leak–free window. Our windows also help save up to 25% on energy bills. 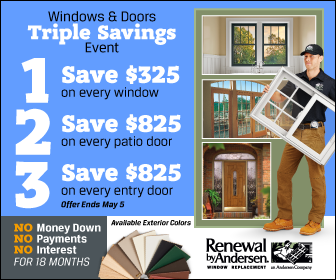 With Renewal by Andersen of St. Louis windows and patio doors, you can do your share in creating a better home and greener environment. We have a wide range of design styles and customization options. We also back our products with strong warranties for your peace of mind. Take the proactive step and schedule a free in-home consultation today. You can reach us at (314) 332-2364 or through our contact form.